This type of LTC protection combines life insurance with a long term care rider. These policies have grown in popularity in recent years. With the best long term care life insurance hybrids having gained significant market share. 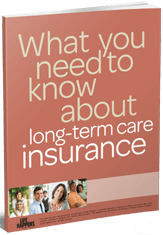 Linked benefit long term care plans is a synonymous term for long term care hybrid products. Linked benefit refers to a long term care insurance rider linked to a life insurance policy. This linked benefit long term care protection joins life insurance, whole life or universal life policies, with a long term care insurance rider. You can fund a long term care life insurance policy with either a single premium payment or over time. Like traditional life insurance, there is a death benefit that will transfer assets to your heirs. Or, the death benefit can accelerate to cover your long term care needs. Premiums invested are not lost if you do not use the insurance. Asset based long term care life insurance can be a great fit if you want to protect your assets against long term care costs and want to transfer assets tax free to your heirs. Health underwriting varies by company and may be more or less restrictive than a traditional long term care insurance policy. Estate Planning Benefits – Life insurance has many uses in estate planning, including: Estate liquidity to pay taxes, debt repayment, income replacement and wealth accumulation. Because a hybrid life insurance long term care policy is built on a life insurance policy, any unused policy value passes tax-free to the named beneficiaries. Guaranteed level premiums can be an advantage of asset based long term care plans. The premium payment can be in the form of a Single Premium or spread out over several years. Guaranteed level premiums are generally not available with traditional long term care insurance. Knowing that premiums can never change allows clients to avoid unexpected premium increases. We continually shop the market for the best long term care life insurance products. Specific insurance company and policy recommendations are made based upon your individual needs. We provide detailed LTC Life Insurance Quotes and help you compare the companies and plan options side by side. The Nationwide Life Insurance Company is a strong and stable company that’s been in business for more than 90 years. Nationwide is a Fortune 100 company with $26 billion in operating revenue in 2015 and consistently high ratings and rankings from the major ratings agencies. When you do business with Nationwide, you can have confidence that they’ll stand behind their promises. With over 150 years of experience, John Hancock’s demonstrated strength and stability is reflected in its strong financial ratings, as judged by the major rating agencies. This is important because these financial ratings reflect the life insurance company’s ability to pay claims in the future. Founded in 1905 with the endorsement of Abraham Lincoln’s son, Lincoln Financial Group is the first and only company to carry Abraham Lincoln’s name, image and ideals at the heart of their brand. They’re dedicated to helping Americans secure better, more optimistic futures for themselves and their loved ones. Securian Financial and its member companies, Minnesota Life, and Securian Life, receive high ratings from independent rating agencies. These ratings reflect their stability, integrity, long-term focus and commitment to maintaining a strong balance sheet. For 140 years, millions of Americans have trusted OneAmerica to deliver on their promises. The companies of OneAmerica keep their promises to insurance and financial services customers by maintaining financial strength. They believe in putting your long-term financial security ahead of their short-term profits, demonstrating two of their guiding values: integrity and stewardship.